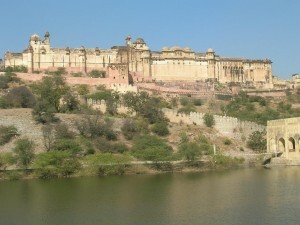 Amber Fort is situated 11 km from Jaipur. This is the magnificent hill fort of Amber. In earlier times the entire complex is owned by the Minas and dedicated to ‘Amba Mata’ the incarnation of earth and fertility. Amber had the distinction of being the capital for six long centuries. A fascinating blend of Hindu and Muslim influence is distinctly discernible in its architecture. Amongst the most majestic of apartments is Jai Mandir or The Hall of victory. The palace complex also boasts as Sheesh Mahal or Pavilion of Mirrors, the finest of its kind, is studded with small mirrors, which reflect a single candle flame in a thousand flickering lights. The like of which is not seen in the country elsewhere. Sukh Niwas, The hall of pleasure is a marvel of 17th century engineering, its best feat being a unique system of ‘air conditioning’. The model operandi was based on a cool breeze blowing through a fall of cascading waters. To ascent fort, jeeps and elephants can be hired near the entrance gate. This entry was posted in Amber, Rajasthan and tagged Fort. Bookmark the permalink.